In developing countries, getting weapons out of the hands of potential rioters and insurgents is critical to society's long-term health. That means patrols, vehicle searches and asking the old people where the young people keep their guns, spears, arrows and machetes. 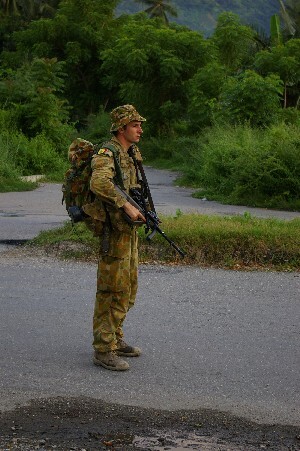 Go on patrol with an Australian army section scouring the countryside for weapons in troubled East Timor by clicking below. The Australian military is a very busy organization all over the world. A thousand troops in Iraq; another thousand in Timor; several hundred in Afghanistan … not to mention Pacific piracy patrols. All for a force numbering less than 100,000 including reserves. These operations run the gamut: the Timor force faces unruly youths in the city and ragtag rebels deep in the jungle; in Iraq, the Aussies maintain an armored Quick Reaction Force that might be called upon to reinforce the Iraqi Army in the barren south of the country; Aussie special forces are active in mountainous Afghanistan, where the fighting is as intense as it’s ever been. With such a wide range of commitments, what kinds of weapons do you buy? That’s a young Australian soldier describing the revenge-minded gang members, often in the pay of corrupt political parties, who comprise one of the greatest threats to stability in troubled, oil-rich East Timor. Little, usually friendly but highly adaptive and fearless in large numbers, Timorese thugs are a lot like Ewoks. (My comparison, not the Aussies’.) Like the vicious spacebears from Endor that helped defeat the Galactic Empire, they improvise deadly weapons from local materials. There are the rebar arrows I described in a previous post. Then there are crude cutlasses, dart guns and javelins – any of which could kill you, especially when wielded by an angry, 500-strong mob, as was the case recently when a New Zealand squad found itself swarmed by warring gang members. Shots were fired in that case, and the New Zealanders fortunately escaped. The U.S. military isn’t the only one “surging” to quell violence in one of its occupied cities. 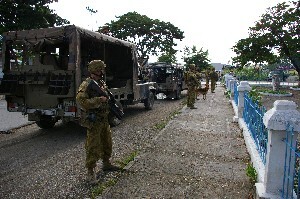 A few weeks ago the Australian military rushed extra troops to Dili in East Timor to clamp down on gangs and rebels in advance of the April 9 presidential election. Only they call it a “flex,” not a surge. Checkpoints are the bread and butter of low-intensity operations in Iraq, Lebanon, East Timor and elsewhere. The idea is to set yourself up in the locals’ streams of foot and vehicle traffic and screen them for the illegal weapons, cash or wounds that might indicate illicit activity. Only one in a hundred checks will turn up anything, but still it’s worth it: checkpoints are boring, but they work. But it’s not just the good guys setting them up. Iraqi militias have been known to stop and search vehicles for members of opposing sects … and kill them. And in Timor, the gang-bangers who are one of the major threats to stability use checkpoints to go at their rivals. Why Wear Body Armor When the Bad Guys Don't Have Guns? You’re an Australian peacekeeper in East Timor. It’s 100 degrees out. Any clothes at all are too many, and here you are wearing a 25-pound armor vest. Why not go without? I’ll give you one reason: sharpened rebar arrows. That’s right, improvised projectiles made of steels rods that are meant for use in construction. In East Timor, the local riffraff fashion bows out of heavy-duty rubber bands and shoot these rebar arrows with enough force to punch through your skull. A couple weeks back, thugs from rival political parties squared off in front of the Australian embassy in Dili. One side had a gun. The other had these bows and arrows. The gunman wound up with a length of rebar in his head. The free world’s “sheriff” in the Pacific has assembled a heavily-armed force of soldiers and airmen to pursue one man accused of fomenting rebellion in one of the world’s newest countries. East Timor broke away from Indonesia, with which it shares a border, in 1999 after a 25-year occupation and formerly declared independence in 2002. 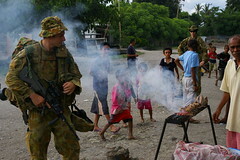 An “International Stabilization Force” comprising more than a thousand Australian and New Zealand military personnel assists a U.N. police force and local security forces in keeping the peace as the country develops. 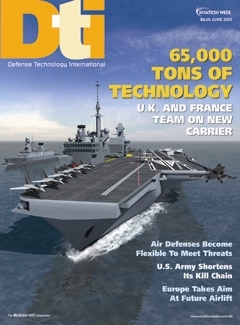 “Operation Astute” represents Australia’s second-largest foreign deployment after Iraq, and was one of the activities U.S. President George W. Bush apparently had in mind when he bestowed the “sheriff” title on Australia. Timorese politics turned nasty a couple weeks back when counter-demonstrators crashed a rally in Dili for presidential frontrunner Jose Ramos-Horta. 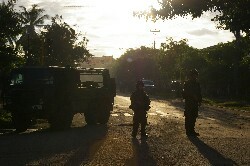 Today there's another rally … and the U.N. force working to stabilize East Timor are taking no chances. Australian troops in trucks and M-113 personnel carriers spread throughout the city. 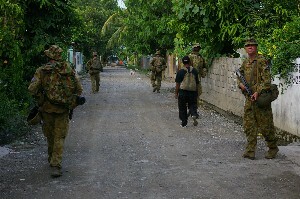 A New Zealander infantry squad arrive early at the stadium to check things out then set out on foot to patrol the area. U.N. cops from Nigeria, the Philippines and Sri Lanka set up checkpoints to make sure only seemingly peaceful demonstrators got through. An Aussie helicopter keeps a lookout overhead.